Spiridione Nicolo Grossi, (1877-1921), born in Liverpool, was a photographic printer, professional photographer, engineer, inventor, designer of photographic equipment and generally something of an entrepreneur. Spiridione is the photographer believed to be most central to the development of the genre of British portrait photography known as “Sticky Backs” or “Stickybacks”. Spiridione’s father, Giovanni (John or occasionally Jean) Baptiste (or Baptista) Grossi, was born in Austria in around 1832. According to Spiridione, his father came to Britain in around 1865 and remained here for the rest of his life. He died in March 1895 of a heart attack while on his way to the Liverpool Infirmary and he is buried in St Annes Churchyard, Liverpool. (Liverpool Mercury 21 March 1895 p 6 and 23 March 1895 p 7). At the end of WW1, Spiridione, probably in order to demonstrate his own nationality and allegiance, was anxious to point out in a newspaper advertisement that his deceased father was a Slavonian-Austrian, not an Austrian, and that his father was loyal to Britain, his adopted country, where he had lived for some 25 years, rather than to the German Empire. (Liverpool Echo - Wednesday 18 December 1918 p1, 20 December 1918 p1). In 1867 John Baptiste appeared in the local trade directory as a photographer at 27 Paradise Street Liverpool. In 1969 John Baptiste was prosecuted under the Foreign Deserters Act 1852 at the instigation of the Austrian Consul in Liverpool, for protecting an Austrian sailor deserter. John Baptiste, said to be living in Lambeth Street Liverpool, was described as the proprietor of a dance house in Whitechapel, Liverpool, and also mentioned having a clothing shop from which he had provided the deserter with a new coat. It was alleged that John “hung around foreign vessels” in the port of Liverpool – (probably to direct foreign sailors towards his businesses). (Liverpool Daily Post 10 Dec 1869 p7). John Baptiste and his brother, Michele, ran the Argyle Refreshment Room, 10 Houghton Street, Liverpool. In 1871 Police visited the establishment and prosecuted the licensee, Michele Grossi, for harbouring prostitutes on the premises. When police returned a few days later they found that all that had changed was that the brothers had swapped roles and John Baptiste, formerly a player in a small resident orchestra at the Argyle, had taken over the licence to the premises while Michele had become a waiter. The court was not impressed and both were fined. (Liverpool Mercury 21 Jan 1871 p 8, Liverpool Daily Post 18 Jan 1871 p7 and 21 Jan 1871 p 8 ). A few days later John Baptiste, 4 Henry Street Liverpool, was advertising for a free vintner to take over the running of the premises (Morning Advertiser 3 Feb 1871 p8). No trace has yet been found of John or his family in the 1871 census, but 4 Henry St was occupied by Hannah Hearne, widow and lodging house keeper and her daughter Mary E Hearne, later to become John’s mother-in-law and sister in law respectively. It seems likely therefore that this was his place of residence, but he was elsewhere or keeping a low profile on census night. In August 1874 at St Peter’s Priory Catholic Church, Liverpool, John Baptiste Grossi of Paradise Street Liverpool, son of Spriidiou Grossi, married Margaret Hearne of Henry Street Liverpool b.1855 Liverpool, daughter of John Hearne, an Irish immigrant. In 1889 John Baptise leased for six years the Cafe Trocadero in Back Lime Street (described as being in the basement of the Hotel St George in Our Liverpool: Memories of Life in Disappearing Britain, Piers Dudgeon Headline Review 2010 P.376 footnote 6). Over the next few years he tried unsuccessfully on a number of occasions to obtain various licences for the premises for singing and dancing and selling liquor. The main objections made by the police alleged the premises were badly run and habitually used by prostitutes. John Baptiste claimed he had sunk around £1000 into the venture. (Liverpool Mercury 1 Feb 1890 p6, 1 May 1890 p8, 30 Aug 1890, 12 March 1892 p7). Unable to get the necessary licences, John Baptiste transformed the Cafe Trocadero into a private members club; the International Trocadero Club. In 1893 the Club attracted the interest of Hugh C. Farrie, proprietor and publisher of the Porcupine, a weekly Liverpool based newspaper. The newspaper sent an undercover reporter into the club and published an exposure of what he proclaimed as "A Liverpool Gambling Hell;" and “A Gilded Resort of Vice and Infamy". The Club’s Committee sued Farrie for libel, but their allegations were dismissed in court on the basis that the newspaper’s comments were justified (i.e. true). (Manchester Evening News - Saturday 12 August 1893 p4). During the evidence given in the two court case it was alleged that John Baptiste Grossi frequently won at a regular card school at the Club, in which his usual seat faced a large mirror (which presumably occasionally helped him to see his opponents’ cards). The fall-out from the Trocadero case continued. The finances of the Porcupine newspaper were on a knife edge due to the costs of the case. A public fund was set up by two local philanthropists which raised the money needed to cover the Editor’s costs. (Liverpool Echo - Wednesday 08 November 1893 P3). In November 1893, a warrant was served on the Grossi household to recover costs owed by John Baptiste. His sister in law argued at court that items removed under the warrant were hers and were wrongly seized. She lost the case, and in her evidence she stated that for many years she ran a money changing business for John Baptiste from 77 Paradise Street. (Liverpool Echo - Tuesday 14 November 1893 p4). The lenient sentence imposed on John Grossi caused further uproar in the local press and led to the local MP complaining about the sentence to the Home Secretary in the House of Commons. (Manchester Evening News - Friday 08 December 1893 p3). In summary, John Baptiste Grossi was a man who had strayed beyond the limits of the law on a number of occasions, an entrepreneur, a gambler and someone well connected with the lower classes of Victorian Liverpool. John Baptise Grossi’s work as a photographer was probably short lived – with just one local directory entry in 1867. There was however another Liverpool photographer with the same surname, Antonio Grossi, who operated from 17 Canning Place Liverpool around 1870. The surname is unusual, so it is possible they were related, but hitherto it has not been possible to prove such a connection. Photography was obviously a trade known to the Grossi family and two of John Baptiste’s children, Spiridione (Spiro) and his younger sister Stella, went on to have life-long photographic careers. Margaret Grossi, sister, widow, b. 1858 Liverpool, ex school mistress, working at home. Spiro Grossi, nephew, b. Liverpool, photographic printer, working on own account. Charles Hitching, servant b. 1836, Dundee. By 20 April 1900 Grossigraph’s address changed to 77 Paradise Street, the Grossi family home. By Feb 1901 the firm’s offerings included photos that were “double size suitable for character or group reproduction” (50 for 2 shillings). By April 1901 Grossigraph was advertising across a wide range of local newspapers, including editions from Cambridge and Peterborough. His adverts from that point included the description of his product as “stamp photographs” and the fact that Grossigraph had branches in Liverpool and on the Isle of Man where, according to their advertisements, “The Isle of Man Visitors say ‘They’ve all got sticky backs’ ”. By this time photos were 25 for one shilling, but by May 1901 this was back to 50 for a shilling. The Grossigraph advertisements ceased after March 1902. Postage stamp sized photographs, some with printed postage stamp like borders, with gummed backs and in perforated sheets were occasionally offered as novelty items from a few photographers from the 1860s until the start of the 20th century. From these have evolved the Stickybacks genre of small photographic portraits which are around the size of postage stamps, have gum on the reverse which works when moistened. These small portraits were affordable by all, not just the middle classes. The stamp like border and perforation of sheets of stamp photographs disappeared. Usually the small stickyback photos were supplied to the customer in strips – multiple copies of the same image making up a strip of three or more images. Because the Stickyback photographer provided cheap products, he or she geared up to deal with large numbers of clients. One aspect of this was to find a method of linking a client with the correct image. Some customers being photographed for the first time might not easily recognise their own likeness in a tiny black and white image. Others might want to return later for other copies. Including a negative, job or a ticket number within the image ensured that links could be made at any time. The easiest way of doing this was to somehow display a job number in the field of view and include this within the finished image. Some photographers took this a stage further and included within the image a sign board on which was written, not just a reference number, but the name and/or address of the studio. Some photographers modified cameras so as to simultaneously photograph the job number on a ticket or special negative held in the the camera itself and to combine this with the image taken. As the brand name “Stickybacks” spread, so many of the photographers producing these images used the name “Stickybacks” on an in-image sign board. The survival rate of these inexpensive tiny images is low, but a few of those surviving bear the Stickybacks sign and reference number on a board either above, or below the image of the sitter. Some stickyback photographers offered either single or double width portraits, the latter needed to portray couples or multiple people. Often the double width stickyback photo included the entire advertising sign board, while the single width stickyback only included the part of the board with the photographer’s address and job number. Some, if not all, Stickyback photographers also produced more expensive products for those who could afford them. The most usual enhanced product was a portrait on a postcard. In this case usually the studio details were printed on the reverse, and it was still common to find a job number captured at the edge of an image. "One day early in the season, probably in 1895, (Editor's note – this may well have occurred a few years little later than the writer recollected) a young man very much down at heel came to interview the boss. They spent nearly two hours together in the private room, the upshot of which was that an order was placed for, I think, one gross packets 12 X 10 plates, and I forget how many 50-foot rolls of paper, which would be 12 inches wide. The young fellow had not the money to pay for all this, but the boss had agreed to let him have supplies as required, the goods being paid for as he went along. This business, which originated the stamp photograph, became all the rage; and as the young man was first in the field for that season he had a monopoly, and from being down at heel blossomed forth in frock coat and tall hat, whilst the business necessitated a greatly increased staff. The result was that the camera manufacturers had to design a new type of camera to do this work. The following year he came over again, with a big staff, commissionaire, boys in buttons, and nearly all his male staff in uniform, and took a large lock-up shop, one of a few that had just been built in front of the Palace grounds. He placed a bigger order than ever for the season, and began to do a roaring business right from the start. One of the staff he had brought over that year was a poor half-wit, a " simple " as they say in some parts of the country, whose duty it was to distribute bills to the crowds of passers-by. A new idea had just been adopted by the young man for his stamp photos, and this was that they were all furnished with adhesive backs. The poor simpleton was instructed to shout out this fact to the crowds of holiday-makers, but he did not understand till it was explained to him, when he began to yell at the top of his voice, " They've all got sticky backs? Have you got a sticky back?" This caught the crowd's fancy, and the catchwords that season were, " Have you got your sticky back? We've all got sticky backs." The young photographer immediately realised the publicity of these catchy phrases, and had reels of white paper printed in black lettering with all these sentences on them, which were freely distributed amongst the visitors. They decorated their hats and coats with these streamers, and so the " sticky back " photograph came into being." I thought what a pretty place. And mash some pretty face. Are they very fond of chaps"
"They've all got sticky backs"
If they've all got sticky backs. if that story gets about"
My pal said "Here's your chance"
Is kissing ladies over here a most expensive job"
And what we say are facts." I said "My darling tell me true, have they all got sticky backs?" It seems likely that Spiridione was the young man described by the chemist’s assistant, or, if not, then he was connected with that same enterprise. Spiridione had a business in Dublin in 1906. The Irish Times on Monday 28 January 1907 p7 reported: "CAR ACCIDENT IN GRAFTON STREET. In Nisi Prius Court on Saturday, before Mr Justice Gibson, the appeal of the plaintiff in the case of Grossi v Collins was heard. It appeared that in August last (August 1906) the pony and cart of William Collins, of Fishamble Street, was in Grafton Street (Dublin). A passing motor car frightened the animal, and sent the cart against Sticky Backs plate glass window, smashing it and doing damage to goods in the shop. Spiriodne (sic) Grossi, popularly known as "Stickyback,” the owner, brought action for damages against Mr. Collins before the Recorder, and his Honor gave plaintiff decree for £20 6s. 3d. Against this decree the defendant appealed. After hearing the evidence of Police Constable O’Brien and other witnesses, Mr. Justice Gibson affirmed the Recorder's order, with costs." A photograph held by the Greater Manchester County Record Office shows that Grossi's business premises at 84 Market Street, Manchester went under the name of “The Post Card Studio”. (Greater Manchester Lives Ref GB124.DPA/652/11) – Spiridione may have used the name “The Post Card Studio” in other businesses. The 1911 Kelly’s Directory for Sussex, shows Spiridione Grossi, photographer, 54 North Street, Brighton. David Simkin, whose excellent site on Sussex photographers, states that Grossi's studio at 54 North Street also went under the name of The Sticky Back & Post Card Studio. By around 1912 the Brighton studio had been taken over by another photographer, Abraham Dudkin. 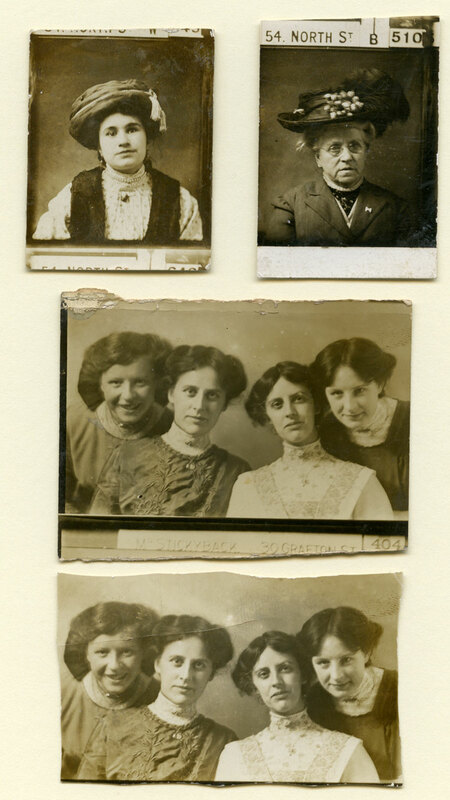 Stella, niece, b.1884, Liverpool, a photographer and an employer. Spiridione was not at the family home in Liverpool on census night 1911, but he appears in Bloomsbury, London, at 10 Russell Square, the home and practice of Dr Michael Joseph Longinotto b: 1870 Deptford, described as a general practitioner. Dr Longinotto was apparently living with two wives, (Gwendoline M Longinotto b: 1881 Uttoxeter and Ellie (or Ettie) Hill b: 1876 Bermuda ). Also resident were three nurses, a butler, three other servants and three patients. Strangely, among the patients was, Spiridiona Grossi, female, aged 34, b: Liverpool 1877, expert photographer, nationality Austrian. By 1920 Dr Michael Joseph Longinotto was listed in the telephone directory as a physician and surgeon at 88 Harley Street. He appear in the British Medical register 1943 – where it is stated that he qualified in July 1894. To date it has not proved possible to discover in what areas of medicine Dr Longinotto specialised. Other entries for Spiridiona (female version of the given name) Grossi, photographer, 5 Marsden Square and 84 Market Street, Manchester appear in the 1909 Slaters Directory. Are these female renderings of his given name merely typographical errors in an unusual name; was he suffering from some sort of breakdown; experiencing some sort of gender identity crisis or making a subtle attempt to obscure his identity? In 1911 Spiridione made his first patent applications. Patent no GB191110251 (A) application 27 April 1911, was for improvements in or relating to Photographic Contact-printing Frames. The inventor and applicant was Spiridione Grossi, address 262, Edgware Road, London, W., whose occupation was given as “designer of photographic apparatus”. His invention was a device holding two full plate negatives and strips of photographic paper. The device enabled each negative (there were up to 60 images on a whole plate) to be aligned with a magazine holding strips of photographic paper. By aligning negative carrier and paper strips in different combinations the device produced strips with multiple prints from each individual negative. Such a device was ideal for the inexpensive production of strips of small photos like Stickybacks, although that name does not appear in the patent documents. An application was made at the same time for a French Patent No FR434670 (A) for the same invention, also in the name of Spiridione Grossi. Similar French patent FR448540 (A) ― 20 Sept 1912, inventors and applicants were Spiridione Grossi and Alfred Lachmann, both stated to be resident in Belgium – no addresses shown . In both cases the invention was a device to enable the person being photographed to make the exposure while still keeping the shutter under the overall control of the photographer. It is interesting that Spiridione was obviously seeing merit in the concept of the subject taking his or her own photograph – an essential feature of the automatic photobooth and the selfie portrait of the future. Any suggestion that Spiridione had gender identification issues would probably be dispelled by the extraordinary events in which he featured in 1913, when he was accused and convicted of abducting a girl under 18 from the care of her parent for an immoral purpose. The girl in question, Edith Dorothy Bold, b. 1897, Liverpool, aged 16, appeared to have agreed to go with Grossi for a holiday in Brussells and to have told him she was 18 years of age. The two had set off to London acting as man and wife. While they were in lodgings in South London waiting to go to Brussells, Spiridione’s sister, Stella, got a message to him, warning that police were making enquiries after the girl’s father had reported her abduction. Spiridione gave Edith some money for lodgings – she did not want to return to Liverpool. Meanwhile Spiridione continued alone to Brussels. Police later found Edith as a result of circulating her photograph. On his return Spiridione was arrested and was later convicted and sentenced to three months imprisonment with hard labour. The case was widely reported, for example in the Illustrated Police News - Thursday 22 May 1913 P7 under the heading of “Alien Abduction Charge” and in the Manchester Courier, 7 May 1913 p12. Edith Dorothy Bold appears to have led a somewhat colourful later life. Twice married and twice divorced, now Edith Dorothy Warner, she was living in Mayfair London in 1939 when she unsuccessfully sued the Elizabeth Arden beauty salon for the loss of a £3,500 necklace allegedly taken from her bag while she was being treated at the salon. The Salon‘s barrister tried to discredit Edith, showing that she had previously worked in a blouse factory for low wages, had only a basic education, yet now appeared to be extremely well off without obvious means of support. He had dug into Edith’s background, suggesting that she had previously claimed the loss of a £12,000 pearl necklace in a taxi, had claimed against an insurance policy for a burglary for over £400 and then again for £12,000 and that at one point she had claimed to have half a dozen respectable male acquaintances who supported her. All of this Edith denied, but she lost her case against the salon, the court finding that the salon did not have a duty of care relating to their customer’s possessions. Edith’s photograph appeared with an account of the case in the Daily Record, 19 January 1939, P2. On 7 May 1913 in the Manchester Courier, p12, in the report of the alleged abduction case, Spiridione was described as having “business interests in Liverpool, London, Manchester, Brighton and Brussels”. There was mention by Edith that she had hoped Grossi might possibly have employed her in his art studio in Brussels – which the court felt was more fantasy than reality. To date no details have been found of Spiridione’s business interests in Belgium. After serving his prison sentence, Spiridione returned to the family home at Paradise Street, Liverpool. During the years that followed occasional reports and local advertisements appeared in the press showing different aspects of his career. In the Liverpool Echo, 29 May 1915 page 2, Spiridione advertised: “Gentleman requires shop in best centre of Southport for summer months for photographic business. Will pay double rent in advance”. It is likely that this advert succeeded as a short let of commercial property during WW1 would have been relatively easy to secure. In May 1916 when he submitted another of his patent applications, Spiridione gave an address at: 27, London Street, Southport. These might have been business premises secured by Spiridione’s advertisement – probably on a short lease as by 1917, No 27 London Street was occupied by a firm of auctioneers and estate agents. The next year, in the Liverpool Echo, Tuesday 18 to Thursday 20 January 1916 page 3, Spiridione was trying his hand at selling motor parts, advertising “New Brougham and Victoria rubber tyres, best makers, will sell both £65 cost £265. Grossi 77 Paradise Street, Liverpool”. By 1916 it seemed that Spiridione was again interested in the design and manufacture of devices for photographers. In the Manchester Evening News 24 March 1916 page 6 he advertised to buy a “miniature guillotine cutting machine, lever handle preferred” and in the Liverpool Echo 14 Nov 1916. Page 1 he advertised: “Persons wanted. Camera maker near centre of Liverpool”. By 1920 Spiridione was working on other non-photographic ideas. In GB Patent No GB142428 (A) he applied for protection of his "Improvements in or relating to apparatus for playing race games". The nature of this invention he described as “an improved race game of the type in which toy horses are progressed along a board or course by means of threads attached to a rotating spindle.” On 28 October 1920 Spiridione again filed a patent, GB19200030463 for apparatus for playing a race game. The 1920 voters register for Liverpool St Peters Ward shows the residents of 77 Paradise Street as Mary Hearne and her nephew Spiridione Grossi. Spiridione, still resident at 77 Paradise Street Liverpool, died, aged 44 on 24 April 1921. His estate, valued at £80.14.6.was administered by his mother, Margaret Grossi, widow, of Liverpool. No trace has yet been found of any direct advertising of Spiridione’s Stickyback apparatus, nor any surviving examples of his camera or printing device. His mode of operation as a photographer appears to have been to take a short lease on premises and attract customers using displays or advertising on the premises rather than through local newspapers. It is highly likely that more of his businesses and photographic activities will be discovered over time. David Simkin, in his excellent site on Sussex Photographers, has uncovered most of the material on this page. David links Spiridione Grossi with two other photographers, Charles John Stewart Reed and Wallace Edward Allan who operated a photographic studio at 54 Market Street, Manchester under the name of "Sticky-Backs" in 1910. The partnership between Reed and Allan was dissolved in January 1911 and from that date Charles John Stewart Reed took control of the "Sticky-Backs" firm. David makes the link on the name, the proximity of this address to Spiridione's business at 84 Market Street Manchester in 1909-11, and the fact that an electrical engineer named Charles John Reed resided close to Spiridione's Brighton studio in 1911. (www.photohistory-sussex.co.uk/BTNStickyBacks54%20NorthSt.htm).